At Primozone® we know how ozone works and can design an ozone water treatment system that will fit your needs. Buying an ozone generator is one thing. Building a complete and efficiently working ozone generator system is another. Different applications need different solutions – we have a proven experience of ozone installations for industrial, municipal and aquaculture applications. One of the main issues with designing an ozone water treatment system is dissolving the ozone gas into the water. 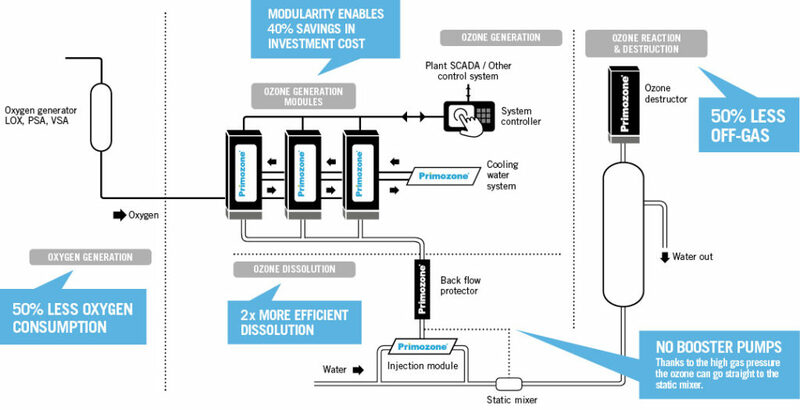 With the Primozone® ozone generator technology the dissolution is facilitated by the high ozone concentration and our design-to-fit dissolution module and reaction tanks. We design complete ozone solutions with everything from oxygen generation and automation to dissolution and ozone destruction. We take the responsibility for designing and building all the way to installation and commissioning. A complete ozone generator system can be designed in many different ways, depending on application and preference. Below is a typical process chart of how we like to design an ozone solution. We supply all of the parts below (apart from piping).